Hello Junkies , Pam here today to welcome you to the 30 Days of Christmas with Technique Junkies - Day 11. The holiday season is fast approaching so we are sharing some fantastic inspiration for your holiday cards from Oct 15-Nov 13! So be sure to stay tuned here and on the Design Team members blogs for new projects EVERY DAY! 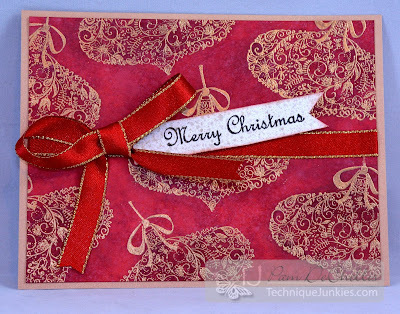 For my holiday inspiration card I used the Ornament 1 stamp (SD640) to create a background for this simple yet elegant Christmas card. 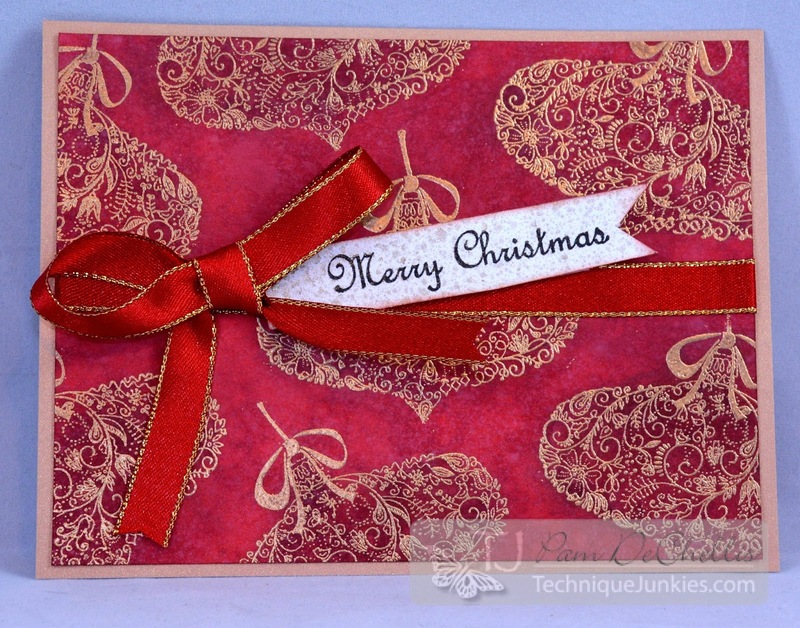 It also features the Merry Christmas 2 stamp as the sentiment! The ornament stamp has such great detail to it and it just looks gorgeous stamped with Versamark Ink and embossed using Ranger Queen's Gold embossing powder. They just come to life! I decided to go with a monochromatic piece and use ink sprays for the background and highlight the ornaments themselves with a little bit of darker red water color. I hope you are enjoying our fab 30 days of Christmas inspiration!